What’s behind the buzz to plant more milkweed across Texas? During spring and early summer, striking flowers attract photographers and admirers as well as the monarchs to green milkweed (Asclepias viridis) and antelope horn milkweed (Asclepias asperula). These central and eastern Texas species are very important to the life cycle of those tiger-orange butterflies, as monarch larvae (caterpillars) feed only on milkweed. 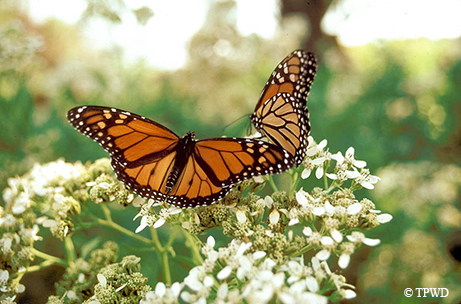 Female monarchs also search for milkweed to lay their eggs. Crossing through the Rolling Plains and High Plains of Texas and New Mexico en route to Mesa Verde National Park in southwest Colorado, my family tolerated my frequent stops to take photos of milkweeds. I submitted the shots to the Texas Milkweeds and Monarchs iNaturalist project. This project’s goals include promoting the importance of wild and planted milkweeds (Asclepias species) to monarchs in Texas, documenting the distribution of native, wild milkweed in Texas, and quantifying the changing importance of different milkweed species to monarch caterpillars throughout the year. As we traversed through the plains, we drove through several summer rain showers. These summer rains encourage the growth of several milkweed species that frequent these landscapes during the hottest months of the year. Sand milkweed (Asclepias arenaria) in dunes and sandhills, with blooms of lateral or solitary pale-green flowers. Engelmann’s milkweed (Asclepias engelmanniana) in sandy and rocky or calcareous soils along creeks and canyon rims, with small flowers that are pale green or flushed with purple. Broadleaf milkweed (Asclepsias latifolia) in prairies on sandy, clay or rocky calcareous soils. Flowers are pale green to yellowish, mostly hidden by the leaves. If you happen to be traveling through the Rolling Plains and High Plains this summer, remember to bring your rain jacket. Don’t be surprised if a thunderhead arises across the plains and provides you with a wonderful backdrop and the fresh smell of rain on the horizon while you encounter summer milkweeds. Size: Species generally range from 1 to 5 feet tall. Did You Know? The white fibers of milkweed can be used to efficiently absorb oil from offshore spills.